I am pleased to announce my selection as a subcontractor to the NYU Wagner School on a major, new grant from the U.S. Commerce Department’s Economic Development Administration (EDA). Under this project, a consortium of experts will help clarify for state and local governments how they can best advance their own economic-development goals by accessing relevant federal programs. For information beyond this brief summary, please see the complete news release from NYU, which was drafted with input from the project managers at the EDA and all the consortium members. Among the outcomes of this project will be a publicly available “one-stop” platform allowing communities to choose more easily which federal programs are best matched to their needs. This resource will help communities make more effective cases for integrated federal support of complex regional partnerships for economic development. The project supports the newly created Office of Economic Development Integration at EDA. The winning consortium consists of senior researchers and program administrators from NYU’s Robert F. Wagner Graduate School of Public Service, the International City/County Management Association (ICMA), and Jobs for the Future (JFF). The principal investigator is Dr. Neil Kleiman, who teaches at the Wagner School and directs its Innovation Labs. I look forward to speaking with many of my economic-development colleagues about aspects of this important project. I have added a new affiliation with a second startup company, again in the B2B space. As part of my participation in a seed-investment round, I am now mentoring/advising DirectDep. The company offers a cloud platform that enables law firms to book individual court reporters for depositions in real time, with many additional time-saving and quality-improvement features enabled by the technology. This is a description vetted and approved by the company. What follows is my own opinion. 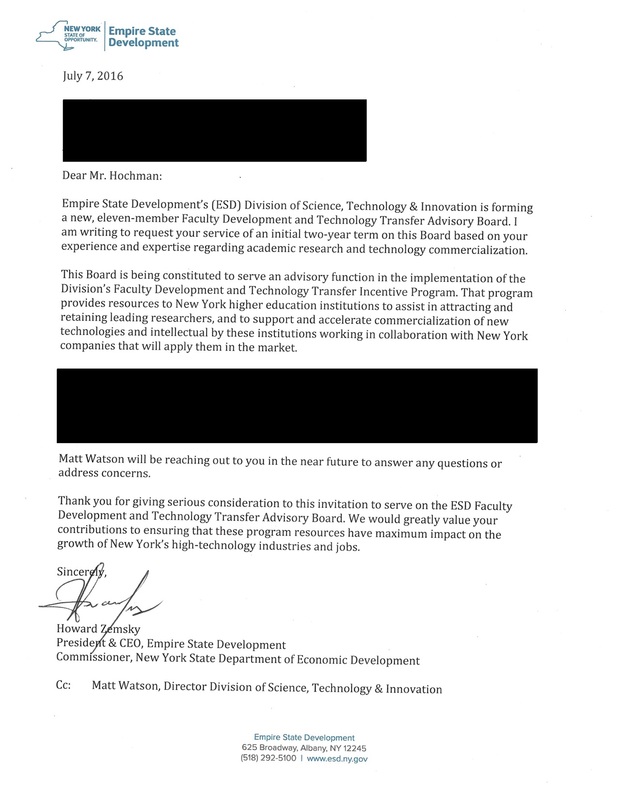 I am pleased to announce that I have been offered and have accepted appointment to the “faculty development and technology transfer advisory board” that counsels the New York State Commissioner of Economic Development on aspects of the “research development program” administered by the Division of Science, Technology and Innovation at DED/Empire State Development Corporation. The appointment stems from my work over the last decade with business incubators in New York State. Although the board is advisory only, because its work affects the allocation of public resources, I have been required to undergo a thorough background check and to file extensive financial disclosures with the state ethics commission. If, as, and when the board meets and deliberates, I will be rigorously disclosing any consulting assignments I have received from eligible NYS academic institutions. I may be required to recuse myself from advising on those applications that pose actual or perceived conflicts of interest and/or to turn down certain consulting assignments that pose undue risks of conflict.